One of the great ironies of life is that some of the greatest works of art and literature have been produced by people who are (to be charitable) not very nice. A prime example of this phenomenon is the long dead Czech writer, Jaroslav Hašek, who authored one of the greatest satirical books of all time, The Good Soldier Švejk. To say that Hašek was less than an upstanding citizen would be an understatement of epic proportions. He was a bigamist - having married a woman in Russia while his first wife waited patiently for him back in Prague. He had a major problem with alcohol - which dogged him his entire adult life and which almost certainly led to or contributed to his early death at the age of 39. He was a ne’er-do-well who constantly sponged off his friends. He was a journalist, an author, an anarchist, a cabaret performer, the founder of a bogus political party, and a Bolshevik commissar in a small community in Russia not long after the Revolution. In short, he lived a big life while possessing character flaws that were every bit as large. Even so, he did have one redeeming virtue. Namely, that he was a great writer - whose incredibly funny book, The Good Soldier Švejk, is a classic that has stood the test of time. At the heart of this book is his iconic character, Josef Švejk, a pleasant and woolly-headed chap whom scholars even now cannot quite figure out. Was he an idiot - as he himself claims to be in the book? Was he a crafty malingerer who used his apparent simplicity and foolishness as a cover for his cunning - as yet others suppose? Or was he a revolutionary hero subverting the military, judicial and governmental authorities of his time - as was thought to be the case by Communist educators in the former Czechoslovakia? Or, or, or.... The possibilities are endless. What is clear though is that Hašek’s character, Švejk, was remarkably successful at surviving in a world gone mad – that is, the vast bloodbath which was the First World War. And he did it all the while by being polite, optimistic, pleasant, obedient to a fault, and quick to embrace orders that made absolutely no sense. These qualities were, of course, a two-edged sword. For, while they ensured his survival, they also got him into trouble - big trouble. Good examples of this include his over-the-top enthusiasm for the Imperial Government - which pretty much everyone else had ceased to believe in - and his oft proclaimed eagerness to die a horrible and painful death for his Emperor in the trenches of the Eastern Front. It was this extreme and clearly misplaced faith in ‘his betters’ which ultimately convinced those officers and medical doctors unfortunate enough to cross his path that he was either a scoundrel, a fool, an idiot or a lunatic - or perhaps all of the above. With the result that a significant portion of his military service was spent in jails, prisons and hospital wards - thus frustrating his stated goal of dying in agony for his Emperor. Still, this book, while hilarious throughout – especially for those of us who harbour a somewhat warped sense of humour – is not everyone’s cup of tea. For it clearly represents heavy going for those readers who possess rigid personalities or delicate sensibilities - given its earthy language and Hašek’s determination to gore every sacred cow in sight. That being said, it is important to note that Hašek is no school yard bully who preys on the weak and mocks the powerless. Rather he punches up - not down. For his harshest criticisms are reserved for those at the top – the hard-hearted individuals who control the soulless military, governmental and judicial bureaucracies that destroy the lives of those poor little human beings unfortunate enough to fall into their clutches. And while it is true that he does poke fun at the foibles of ordinary people, this is little more than good-humoured teasing that is not meant to leave a mark. While the book is full of memorable characters, perhaps one of the most fascinating must surely be the military chaplain, Father Otto Katz, who employed Švejk for a time as his batman. To make a long story short, Katz was a very bad priest – whose sole reason for entering the priesthood in the first place involved a desire to improve his career prospects. From Katz’ rather twisted point of view, the priesthood represented a dream come true. It allowed him to earn a reasonable salary. He didn’t have to work very hard. And apart from having to say the occasional mass, he could do whatever he pleased with his time – which in his case involved playing cards, socializing and engaging in more or less constant heavy drinking. With pastimes such as these it is little wonder that he and Švejk got on like a house on fire – a friendship which ended badly when Katz lost Švejk in a card game to another officer, Senior Lieutenant Lukaš, who then became his new boss. From the unflattering (and extremely funny) portrait of Father Katz contained in the book, readers might suppose that Hašek was not all that well-disposed toward the Catholic Church. And they would be right to think this. But if Hašek portrayed Holy Mother Church in a bad light, at least he did it with wit and humour - unlike many critics today - which to my mind covers a multitude of sins. And Hašek’s negative view of the Catholic Church (a sentiment still held by many today in the Czech Republic) is easier to understand when seen in the context of events in Czech history where the Catholic Church has from time to time played a less than beneficent role in that nation’s history. One such black mark was the martyrdom of the Czech national hero, Jan Hus, who was burned at the stake at the Council of Constance in 1415 – an event for which Pope John Paul II issued an apology in 1999 in which he expressed regret for Hus’ “cruel death”, praising his “moral courage”. Yet another incident was the destruction of the Czech nation after the Battle of White Mountain (Bilá Hora) in 1620 and the brutal forced re-Catholicization that followed it - the memory of which continues to haunt the Czech Catholic Church even today. Such memories, once in the culture, do not die easily – and Hašek clearly did his best to keep this national grudge alive. Consistent with this is a strong moral critique that runs throughout the work, including one particularly noteworthy warning against loose living (not a little ironic given Hašek’s very messy life) where he declares that, “After debauches and orgies there always follows the moral hangover.” A clear warning for our own generation as we watch the wheels come off Western Civilization! Given the powerful moral undertone running through the book, it is safe to conclude that Hašek’s work is far from being the simple harmless fun many suppose it to be. For he frequently makes use of what might best be described as Galgenhumor – that is, black humour or gallows humour. And it is humour that rings true to life since Hašek knew what he was talking about. For he served in the 91st Infantry Regiment of the Austro‑Hungarian Army in the truly horrific First World War which saw some 41 million civilian and military casualties (18 million dead and 23 million wounded). This included the death of between 1.2 and 1.5 million Austro-Hungarian soldiers and total Czechoslovak casualties of about 185,000 (155,000 military personnel and 30,000 civilians). With butchery on this scale, Hašek had more than enough examples of human misery and military stupidity to draw on. Happily, suffering on such a vast scale did not go to waste on Hašek whose portrayal of the insanity of war was masterful. Unfortunately, it was also inspiration which cost the author dearly, causing him enormous emotional pain – a reality evident from even the most cursory reading of his book. For his humour has an edge. It cuts like a razor. This is clearly a book that has a point to make – a point which Hašek is determined to make sure we get. And millions of readers around the world have got his point ever since the first segment of the book was published in 1921 – all the while roaring with laughter at the misadventures of poor, benighted Švejk whose fame has spread around the world, having been translated into some 60 languages and turned into numerous movies and made-for-television productions. Of course, the real test of genius rests not on whether a literary work was well received at its time of publication, but rather if it is able to stand the test of time. By such a measure it is obvious that Švejk is indeed a classic since it continues to speak to modern readers every bit as clearly as it did back in 1921. Part of this is due to the wit and clarity of Hašek`s writing. But that’s only part of it. For many witty, well written books have fallen out of favour over the centuries, never to be read again – in large measure because they failed to address the needs of successive generations of readers. But such is clearly not the case with Hašek`s book which continues to delight readers around the world – and for good reason! For The Good Soldier Švejk is not simply about the comic misadventures of one somewhat foolish man living a century ago in Central Europe – as amusing as these anecdotes might be. Rather it is bigger than that – and more profound – a reality that becomes crystal clear when you take the time and effort to delve into it and read between the lines. For it is then that you see that this is a book that seeks to say something important about the human condition – which sadly does not seem to change much with the passage of time. Because, like it or not, the truth is that mankind and its failings remain very much the same as they were in Hašek`s time. Technology has changed, of course. And our economic and political systems are very different from those which existed in Hašek`s time. But the brokenness seen in all human beings and the terrible cruelty and stupidity of human society continue very much as they did when Švejk was written. Wars still rage. Injustice and bald-face lies remain a major feature of public life. And the heavy hand of corruption, the soul-destroying reach of bureaucracy, and the denial of freedom of thought and conscience continue to plague the lives of ordinary human beings very much as they did in Hašek`s time. So the need to laugh at the sheer stupidity of those directing our lives remains every bit as strong as in the past. Think of it, if you will, as a sort of psychotherapy which allows readers to remain relatively sane in a totally mad world that shows every sign of spinning out of control. That’s where Hašek`s literary classic comes riding in to the rescue. So lift a glass of good Czech beer to the memory of this great writer, whose compassion for the sufferings of the much abused ‘little people’ of his time justly qualifies him for the title of Patron Saint of the Common Man. 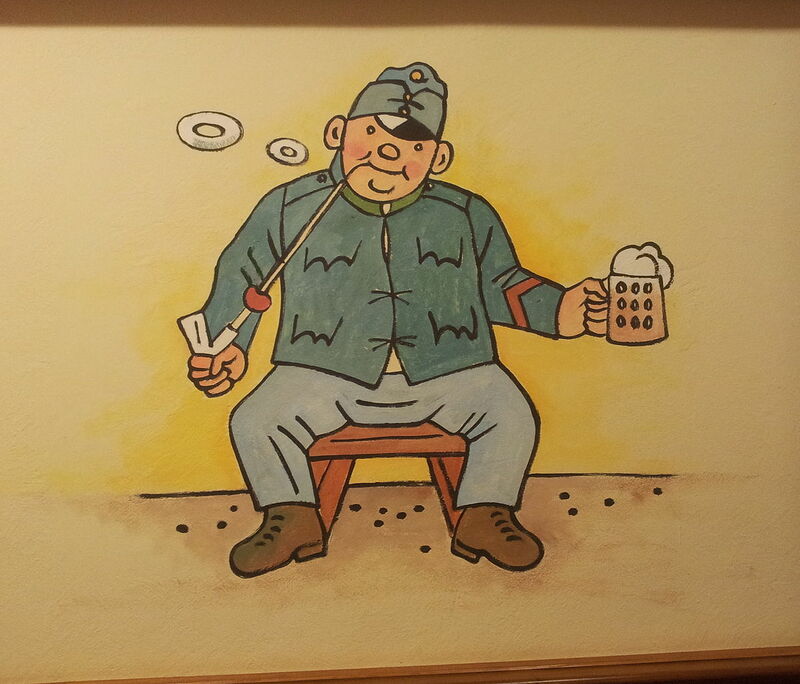 May his memory continue to be revered and may his iconic character, Josef Švejk, (who lifted more than a few beers in his time) continue to delight readers forever.